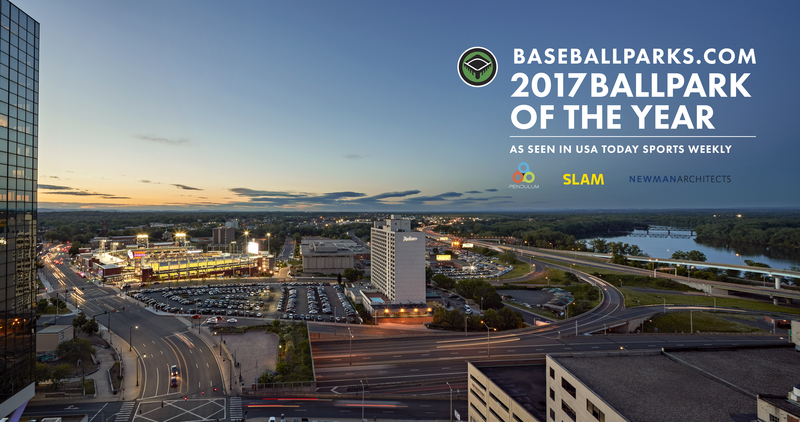 Hartford, Conn., August 11, 2017 – Dunkin’ Donuts Park, home of the Colorado Rockies’ Eastern League affiliate Hartford Yard Goats, has been awarded BaseballParks.com’s “Ballpark of the Year”. The award was announced in the August 9th edition of USA TODAY Sports Weekly by Joe Mock, webmaster and founder of BaseballParks.com and frequent contributor to USA TODAY. This prestigious honor has been awarded to new or substantially renovated ballparks for the last 18 years, and this year in particular featured formidable competition. Dunkin’ Donuts Park was selected from an all-star cast of facilities including SunTrust Park, the new home of the Atlanta Braves, and The Ballpark of the Palm Beaches, the spring training home of the Houston Astros and Washington Nationals. Jonathan Cole, founding principal of Kansas City, MO-based Pendulum, was Architect of Record for Dunkin’ Donuts Park. He was joined by key members of the design team including Peter Newman, principal of Newman Architects and The S/L/A/M Collaborative’s Rick Bouchard, Chris Sziabowski, and Derek Czenczelewski on the pregame announcement with Joe Mock on the Yard Goats’ radio broadcast. Dunkin’ Donuts Park now joins an elite list of award recipients, including Major League Baseball stadium icons like AT&T Park, home of the San Francisco Giants, Petco Park, home of the San Diego Padres, and PNC Park, home of the Pittsburgh Pirates.